Designation: Department of Physics, State University of São Paulo-UNESP. List of Author(s): Péricles Lopes Sant’Ana José Roberto R. Bortoleto, Nilson C da Cruz, Elidiane C Rangel, Steven F. Durrant, Laura Moreira Costa Botti, Carlos Alberto Rodrigues Anjos, Sofia Azevedo, Carine Isabel, Vasco Teixeira, Eber Antonio Alves Medeiros, Nilda de Fátima F Soares. Citation: Ana PLS, Bortoleto JRR, Cruz NC, Rangel EC, Durrant SF, et al. (2018) Surface Properties of PET Polymer Treated by Plasma Immersion Techniques for Food Packaging. Int J Nano Rech. Vol: 1, Issu: 1 (33-41). Copyright: © 2018 Ana PLS, et al. This is an open-access article distributed under the terms of the Creative Commons Attribution License, which permits unrestricted use, distribution, and reproduction in any medium, provided the original author and source are credited. In this work, it was used a vacuum system on a set up well exploited, in order to use Plasma Immersion Ion Implantation (PIII) and Plasma Immersion (PI cathode or PI anode), which were suitable techniques for the surface treatment over the Polyethylene Terephthalate (PET) substrates, from Coke bottles of 2 LTM. The purpose was: to change their wettability, surface morphology and optical transmittance at visible light. Some papers regard the physic-chemical alterations on the surface of PET samples. However, the selectivity of those plasma treatments, results in a notable and partial combination of surface properties, even with serious restrictions. It’s reasonable to reveal the results founded here, using nitrogen and fluorine plasmas, since exposing the sample holder at the room temperature during the treatment time of 900 s. The Origin software 8.0 fitted the graphs that show: The evolution of surface wettability behavior depends on the plasma technique applied and the gas employed to them. In some cases, the surface hydrophilization was not stable as seen by the temporal evolution of the contact angles measurements, Ɵ (t). By the AFM images, it is possible to view a mild modification of the PET surface immersed in the plasma, whereas: roughness Rz, increased only a few tens of nanometers, in relation to the virgin PET (1.8 nm), even in a strong ion bombardment during the treatment. As a general trend, the roughness increases slightly for all techniques. Finally, gain or loss of optical transmission, T (λ), at visible radiation, depends on the parameters of the plasma treatment. PIII technique and N2 bombardment are more indicated than the plasma immersion and SF6 bombardment to increase the transmittance of PET at visible region. In general, those parameters selected imply in a positive plasma conditions, considering the overview to try out a technological destination for recycled commercial polymers. Wettability, Morphological surface, Optical transparency, PET. Packaging has a fundamental role in ensuring safe delivery of goods throughout supply chains to the end consumer in good condition. It also has great potential to contribute to sustainable development. The increasing environmental concern among consumers in their selection of food products also seems to include the packaging as reported by Rokka and Uusitalo . Packaging plays an important role in preserving, protecting and marketing products during their storage, transport and use . In this sense, the introduction of new technologies could lead to a reduction of the processing time or an improvement in operating conditions, thereby decreasing both environmental and financial costs . Plasma treatments cause several chemical and physical changes on the plasmapolymer interface, which improve the surface properties [4-8]. Plasma-induced effects on the polymer surface are nowadays exploited in surface functionalization of the packaging polymers, for promoting adhesion or sometimes, enhanced printability , assuring anti-mist properties, improving the polymer’s adhesion of antibacterial coatings [10-14], which is interest for food packaging. As mentioned, plasma treatment can improve surface properties of polymers such as wettability and surface functionalization, and consequently also adhesion properties. This may be important for coating the food-packaging foils with antibacterial layers . Mieth, et al. lists the most common polymers in packaging materials, their functions in the packaging and some applications. Polyethylene is used as heat sealable food contact layer moisture barrier which can be combined with gas/aroma barriers. Polyethylene terephthalate (PET) can provide gas/aroma and moisture barrier to provide mechanical strength heat resistance. However, some recent studies show the migration of chemical substances from PET to water in bottles  from 40 ºC and 60 º C of storage. Fang et al  concluded the migration increase with the storage temperature. These studies reinforce the opportunity of applying surface treatment in polymers for food packaging. There are many techniques that can be used to modify or alter the surface properties of materials by addition of particles; coatings and functional groups [19,20], however, the growing interest in ion-implanted polymeric materials is due to its increasing demand in various disciplines. Recent results from PET treated by plasma at low temperature atmosphere were presented by Novák et al . Sant’Ana el al showed recently, the improvement on wettability, and the changes on the surface roughness and optical transmittance in the visible region for the PET (from coke 2 L.) treated by plasma immersion techniques . A gradual increase of the applications of PET bottle formats, were reported in other recent studies . The partial hydrophobic nature of PET results in poor uptake and adhesion of dyes, particles and microcapsules , which reinforce the importance of treatment for improve the PET wettability. Recent studies associated the improvement of wettability with the increase of oxygen groups on the PET surface after plasma treatment . In this study it was used plasma immersion techniques (PI and PIII), in order to improve the wettability of PET polymer, to promote low surface roughness and high optical transmittance in the visible range, because these PET surface features are in agreement with food packaging industries. (i) The substrate holder and the chamber walls were grounded while RF power was fed to the opposite electrode - PI anode. (ii) The RF power was supplied to the substrate holder while the opposite electrode and the chamber walls were grounded - PI cathode. (iii) The RF power was applied to the opposite electrode while negative pulses of high voltage were applied to the substrate holder (300 Hz, 30 μs and -2400 V) - PIII. The wetting of the PET samples was evaluated by the contact angle measurements of the samples, using a Rame- Hart 100-00 Goniometer; in other to obtain the wettability of the PET samples after plasma treatment. The Atomic Force Microscope XE-100 from Park Instruments was employed to report the RMS (The mean square roots) roughness of PET samples taking 5 μm × 5 μm areas and, the optical transmittance was measured by a Lambda 750 Spectrometer UV-VIS-NIR, ranged from 190 nm to 3300 nm of electromagnetic spectra. The contact angle, Ɵ, was determined by the sessile drop technique using deionized water at room temperature . The test was conducted on three spots on the surface for each condition . The values of the contact angle were taken as average values of three drops on the PET surface. An image of the water droplet was captured and imported into the image analyzer software to evaluate the contact angle for each condition. The contact angles, Ɵ were acquired before and immediately after the plasma treatment, and also, Ɵ was collected after 30 days. Table 1 shows the conditions and results of Ɵ. Table 1: Conditions and results observed in this work. Plasma treatment has been achieved to make distinctive, the behavior of surface PET samples according the gas employed. Using N2 for the treatment, oxygen containing groups can be inserted on the surface of PET. All samples were submitted to 298 K once; a cooler system was employed, in order to maintain all substrates at environment temperature conditions. The insertion of the nitrogen on the surface of PET, involves Carbon and Hydrogen recombination with another substances. The number of bonds broken in this process is high enough to promote the following recombination between carbon, hydrogen and oxygen and also is considered the bonds between nitrogen and two molecules of hydrogen, connected by Van der Waals bonds . These molecular groups are highly polar, explaining so, the decreased of contact angle on pure water, independently of RF Power. The table 1 show the wetting results. Figure 1 shows the values of contact angle, as function of the aging time for samples treated with N2 for the three different techniques. The highest value of contact angle occurred for 100 W of RF Power by PIII at 100 W (~120º) after 21 days of aging time, while the lowest value of Ɵ, was 0°. According to Darbello , polymeric chains have freedom of movement and consequently, they can set polar groups towards surface or not. Moreover, migration of molecules from short chains oxide can be diffused into the PET from the bulk towards the surface. Ɵ evolution on aging time of PET surfaces that were exposed to N2 plasma for 900 s, at 25 W and 100 W of RF Power. 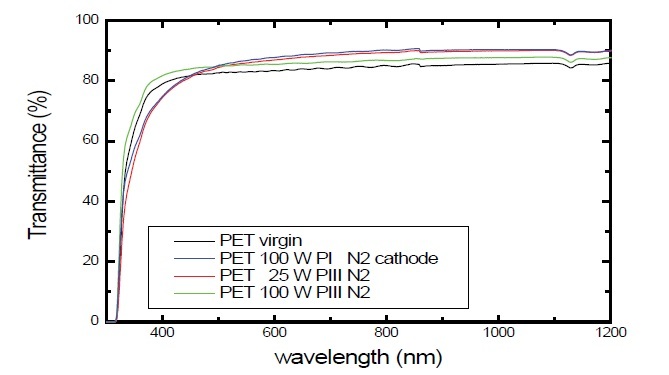 Figure 1: Ɵ evolution on aging time of PET surfaces that were exposed to N2 plasma for 900 s, at 25 W and 100 W of RF Power. Glow discharge plasma-based treatments are of particular interest because they allow surface hydrophilization without inducing bulk modifications. The atoms from the surface can react with oxygen and water in air after the treatment to form oxygen-containing groups, and therefore turn the surfaces into hydrophilic ones. The water contact angle decreased initially with the treatment time . In figure 2 this tendency is attenuated for the treatments using fluorine. The best performance of this work can be observed in those “curves”, especially for (PIII, and PI cathode 100 W) conditions, whereas the fluctuations were very small. Figure 2, shows Ɵ evolution in until 30 days. Ɵ evolution on aging time of PET surfaces that were exposed to SF6 plasma for 900 s, at 25 W and 100 W of RF Power. 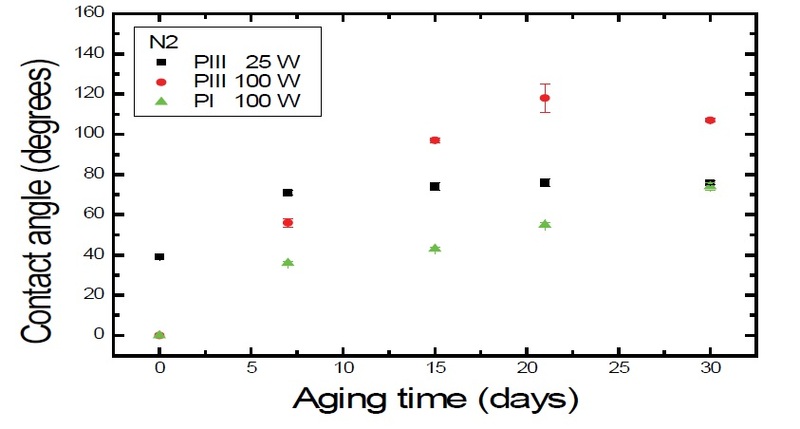 Figure 2: Ɵ evolution on aging time of PET surfaces that were exposed to SF6 plasma for 900 s, at 25 W and 100 W of RF Power. Samples treated with SF6 causes hydrophobic surfaces. The hydrophobic surface properties might be increased and stabilized owing to the replacement of C-H bonds or oxygen containing groups by C-F bonds or even the incorporation of CF2 and CF3 groups onto the polymer surface after treatment, using fluorine source [31-34]. Although C-F bonds are highly polar, these species when present on the surface of a material will increase the hydrophobicity. It has been demonstrated that fluorination of PET surface can be achieved through fluorine radicals generated in the sulfur hexafluoride plasmas. Fluorinated polymers have interesting properties including good chemical stability [35-37]. The effect of roughness on the wettability of a surface has been quantified by Wenzel and Cassie-Baxter. The Wenzel scenario proposes that roughness enhances the hydrophilic or hydrophobic character of a surface i.e., Ɵ (contact angle) decreases/increases with roughness for hydrophilic/ hydrophobic materials . RMS values can be obtained using standard deviation of the height values in a given area , which were 5 × 5 μm2. Hence, it was possible to show the two-dimensional AFM surface morphology of the PET samples before and after the plasma treatment using N2 as shown in figure 3. Figure 3: Ɵ AFM 5 μm × 5 μm of scans of PET samples: (a) untreated PET – R = 1.8 nm; (b) treated with N2 plasma (50 mtorr, 100 W, 900 s by PI cathode - R = 4.4 nm); (c) treated with an N2 plasma (50 mtorr, 25 W, 900 s by PIII – R = 1.4 nm); (d) treated with N2 plasma (50 mtorr, 100 W, 900 s by PIII – R = 1.7 nm). The surface of the untreated PET sample is smooth (roughness R rms = 1.7 nm) showing no pinholes, with aligned fibers as seen in figure 3 (a). There are risks inherent in the process of cleaning of PET samples. After the implantation, the PET surface became slightly rough by plasma immersion PI cathode. Also in relation to virgin PET, there was a slight decrease on surface roughness of the samples that were implanted, which were: 1.4 nm and 1.7 nm while rf powers were: 25 W and 100 W, respectively. The lowest contact angle was detected for the deposition of 100 W, corresponding to Ɵ=0º, as seen in figure 1. In fact, two mechanisms may have contributed to the reduction in the values of the contact angle for PIII: increasing the surface roughness of the polymer, which in turn led to increased contact area, that is, increasing the number of species chemically bind with water molecules (i.e., amine groups - NH2) or other polar groups with oxygen and oxygen containing groups (i.e carbonyl, carboxyl, hydroxyl and others). The same mechanism  was observed when nitrogen atoms in the treatment of PLA polymer whereas the NH3 plasma created reactive amine groups on PLA scaffolds that anchored collagen through polar and hydrogen bonding interactions. After N2+ implantation on the polymer surface, new function polar groups appeared and localized up to 40 nm in depth observed to High Voltage from 1 keV to 5 keV. These results indicated that the generation of new function groups with nitrogen or oxygen ions affects the surface sorption. For further studies, correlations of the gas penetration with new polymer elements should be investigated , because of the original roughness is kept, next to (R rms=1.8 nm) being similar to PET samples untreated figure 4. AFM scans of PET samples: (a) treated with an SF6 plasma (50 mtorr, 100 W, 900 s by PI anode – R = 1.8 nm; (b) treated with an SF6 plasma (50 mtorr, 100 W, 900 s by PI cathode – R = 4.7 (c) treated with an SF6 plasma (50 mtorr, 25 W, 900 s by PIII – R = 2.6 nm); (d) treated with an SF6 plasma (50 mtorr, 100 W, 900 s by PIII - R = 2.5 nm ). 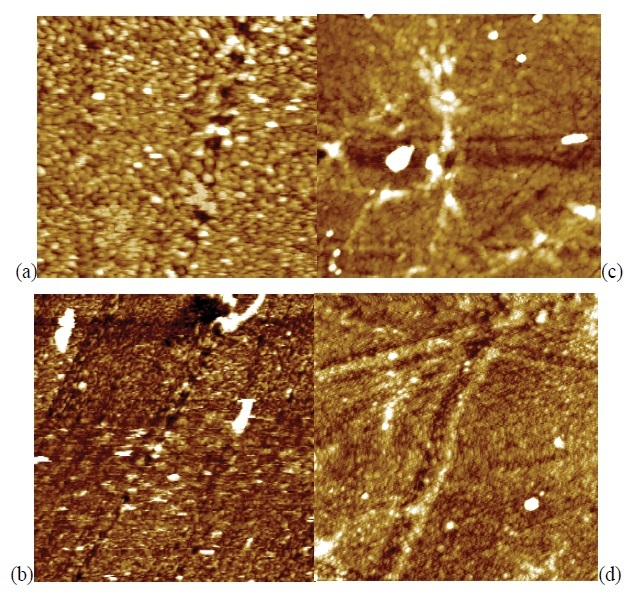 Figure 4: AFM scans of PET samples: (a) treated with an SF6 plasma (50 mtorr, 100 W, 900 s by PI anode – R = 1.8 nm; (b) treated with an SF6 plasma (50 mtorr, 100 W, 900 s by PI cathode – R = 4.7 (c) treated with an SF6 plasma (50 mtorr, 25 W, 900 s by PIII – R = 2.6 nm); (d) treated with an SF6 plasma (50 mtorr, 100 W, 900 s by PIII - R = 2.5 nm ). The morphology changes can result from the chemical reaction of SF6 plasma or the thermal effect. However, in this work, it is likely that etching contributed to the surface roughness because fluorine plasma promotes etching of species . It might suspect that rough surface of the treated samples is attributed to wettability. The roughness have an influence on the water absorption time since the water droplet deposits on the spike of the surface feature and does not have complete contact with the mutual surface. Analysis revealed the independence from PIII of PI techniques because of stopping and short range ions penetration, once there were six bonds to be broken against one bond to be broken from N2. It’s implied that the SF6 molecule suffered a considerable energy loss when collide with surface during bombardment by low energy. On the other hand, PIII promotes a moderate range of ions penetrating c-axis direction towards the bulk of samples. Under the same conditions, the ion implantation modified the PET samples, which became it very hydrophilic. Optical transmittance reveals that the plasma immersion technique is more indicated to maintain high transparency at visible light. To observe the effect of the plasma processing on the transparency of the PET samples, we have conducted optical transmission analysis on plasma treated samples and, we compared them with the original untreated ones. 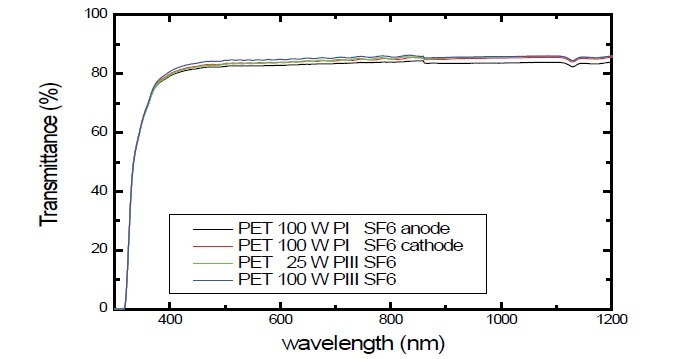 The graphs of figures 5,6 show respectively, the optical transmittance spectra of PET treated with plasmas of N2 and SF6 by PIII and PI techniques. Plasma Immersion Ion Implantation was applied for 900 s (15 min.) at a pressure of 6.66 Pa (50 mtorr) while the radio frequency power was varied between 25 W and 100 W. PIII parameters were: 300 Hz, 30 μs and -2400 V.
Optical transmittance as a function of the wavelength of PET samples treated with 50 mtorr of N2 for 900 s.
Figure 5: Optical transmittance as a function of the wavelength of PET samples treated with 50 mtorr of N2 for 900 s.
Optical transmittance as a function of the wavelength of PET samples treated with 50 mtorr of SF6 for 900 s.
Figure 6: Optical transmittance as a function of the wavelength of PET samples treated with 50 mtorr of SF6 for 900 s.
As a general trend, the transmittance remains practically constant in the range of λ 400-700 nm (visible) and progressively decreases for λ below 400 nm. Thus, the plasma treatment have influenced distinctively in the transmittance of PET. Similar results were detected by plasma immersion. The same conditions were applied to the samples treated with SF6. After the N2 + implantation on the polymer surface, new function groups of (-CN-) and (-CON-) could appear about 40 nm of depth. According to Okuji , diffusion coefficients decrease after modification. It is suggested that the physical structure on the polymer surface is changed and that seems to be one of the reasons for the enhancement of gas barrier properties . This result indicates that the generation of new function groups with nitrogen ions affects the surface sorption. As a general trend, the transmittance remains practically constant in the range of λ 400-700 nm (visible) and progressively decreases for λ below 400 nm. It is possible to increase the transmittance applying low or high energy, independent on reorganization of groups on the surface, and considering the distortion effects along all the PET structure. The change of the plasma composition was analyzed using SF6 plasma. The values were not significantly different. It is evident that the use of SF6 plasma results in the surface modification without changing the bulk structure of the polymer, such as crystallinity. The bulk structure is responsible for the mass transportation property which governs diffusion and permeation of molecules. Keeping focused on the evidence of the effect of using high and low energy by means of PIII and PI application, respectively. Ion implantation has increased transmittance at visible light to nearly 95%. For instance, at high powers there is a greater fragmentation of species by bond breaking, and subsequent recombination between different species of the plasma, causing greater distortions in the chains entanglement and rearrangement, thus reducing or increasing the free path of the incident radiation  in a very limited range. Even for treatment using nitrogen which is more penetrate than fluorine; the deftness is not a parameter to make optical transmission available, because, roughness has a scale about few nanometers, a similar scale of wavelength. Thus, it is important to consider the change of last layer of polymeric chains on the surface level which suffered a slight increase of roughness because of the break on the polymeric chains due to the backbone into the polymer bulk. In addition, ultraviolet radiation supplied by the plasma can provide the PET degradation, once this polymer is suppressed by this radiation. Moreover, the plasma consisting of hydrogen, nitrogen and oxygen is used to optimize the radiation of the plasma in the required wavelength range of 230 nm ≤ λ ≤ 280 nm , characterized to be very efficient to reduce B. atrophaeus spores. For other spores (i.e. Aspergillus niger), radiation below 200 nm is more effective to kill the spores . It is a good evidence of power of surface cleaning for samples, which were treated to these conditions. The asepsis is an important feature to consider because of the food safety issues, once PET is largely applied as food packaging. Nevertheless, Sant’Ana 2017  showed the great potential of PET treated by PI and PIII, using N2 and SF6 plasmas, aiming to reach the high performance of the surface properties for food packaging, revealing for those samples, good wettability, low surface roughness and high optical transmittance at visible light. Beside the low changes in surface topography, nitrogen plasma treatment causes oxidation of polymeric chains making the surface more hydrophilic . Oxygen is a highly reactive gas, and the plasma conditions used in the experiment completely dissociated the oxygen gas into different species inside the plasma chamber. Oxygen radicals in the plasma react with the functional groups at the surface of the PET sample causing surface etching effect , which explain the low roughness after PIII and PI treatment. It is probably that the O incorporation immediately after treatment causes high hydrophilicity. As long as the O goes out the polymer matrix, the tendency in aging wettability is become more hydrophobic. Another polymer, PVC, was also treated in the same conditions, and they presented high proportion of oxygen group’s comproved by FTIR and XPS analysis as viewed in . On the other hand, the higher degrees of the fluorine incorporated on the surface, increases the hydrophobic character, confirmed by the high values of θ, which implies non-chemical attraction between the fluorinated surface and the test fluid. Only few studies evaluating the effect of the operating frequency . The author reported from his last study about fluorine and nitrogen plasmas on PET by PI and PIII,  that the wettability changes were attributed predominantly, owing to chemical alteration, which also presented high hydrophilicity using nitrogen, and high hydrophobicity using fluorine. The increase of the surface energy is mainly attributed to the formation of polar functional groups on PET surface during the progress of the treatment . In all cases, the roughness was also unchanged. We must evidence that these results were conducted without a substrate cooler system and the temperature immediately after the treatments were ~80 º C. So, it is concluded that the temperature has not influenced to increase significantly the roughness of PET samples, however, the low temperature of the PET substrates during the plasma process were primordial to maintain the wettability stables in until 30 days for fluorine treatments. In addition the low temperature of the PET substrates during the fluorine plasmas was also decisive to maintain or increase the high transparency in the visible range, according to T (λ) results. The low roughness favors to promote low reflectance of radiation, which contribute with high optical transmission in the visible. The absorption will occur bellow 300 nm, because PET absolves UV radiation. It is believe that the high temperature causes great distortions and interlacing’s that can obstruct the free path of incidence radiation and then decreases the T (λ) in the visible range, especially for nitrogen treatments, that is more penetrate than fluorine. Even though PI and PIII are indicated techniques to improve the gas barrier of PET. It is believed that crosslinking formation is responsible to create a close matrix with a ten of angstrom of thickness that attenuates the transmission rate of steam. The results about gas barrier are attributed to high barrier material, as better discussed by Sant’Ana . Besides new surface improvement, a good performance of PET can be attributed to plasma treatment for adhesion properties [50,51], which can be an important feature for packaging applications. Other studies reveal that low fluctuations in the roughness of PET assisted by plasma are important for gas barrier [52,53] whereas in the best condition, the PET presented low Water Transmission Vapor Rate (~2.7g/m2-day), which is similar value to the PET treated by PI and PIII, according Sant’Ana . According Tenn et al  alteration of the barrier properties is one of the crucial factors for research as it is related with the shelf life of the food product being packaged. In other studies, it was proved the use of plasma technology for food packaging due to the fact that surface modification may be accomplished through surface activation, etching, cross-linking, functionalization, film deposition or by some combination of these effects . In general, the resulting material becomes a potential one for the development of food packaging, combining selective wettability and its stable in until 30 days, low roughness and high optical transmittance in the visible range. The purpose of this work is in agreement with the environment issues, which comprises the idea to reuse recycled polymeric food packaging . This technology does not require extreme process conditions for food packaging treatment and can be used as a good alternative source for food preservation without affecting its nutritional and sensory attributes. Packaging material is responsible for the protection of food from the outside environment during handling, transportation and distribution. For instance, cold plasma is suitable to kill spores as referred in [43,44], and to reduce microorganisms. The asepsis is an important feature for food packaging. I was observed that sulfur hexafluoride plasmas were accomplished to reduce A. parasiticus  while nitrogen plasmas were accomplished to reduce E. coli . Then, Plasma is also involved in the decontamination of the surfaces of the packaging material and even to prevent the post-packaging contamination of the food product. Muranyi et al  reported reductions of Aspergillus niger and Bacillus subtilus in PET foils. Cold plasma can also, be used to immobilize the substances like bioactive compounds, vitamins, colors, anti-microbial compound to improve the functionality of packaging material. In addition, cold plasma technology is environmental friendly and fulfilling all ecological standards, according recent studies , so it is having the potential for large scale process in food industries for the surface treatment of the packaging polymers. The overwhelming majority of papers report results from surface chemical investigations. Given this, the modifications of the plasma treatment in the samples were positive on the basis of selectivity in the character of wettability and optical transparency, thereby increasing the hydrophobicity by means of SF6 (which Ɵ reaches near 140º), or increasing hydrophobicity using N2, (which Ɵ reached 0º) in addition; maintaining the optical transparency to visible light of PET samples through the techniques of plasma at low pressure system. 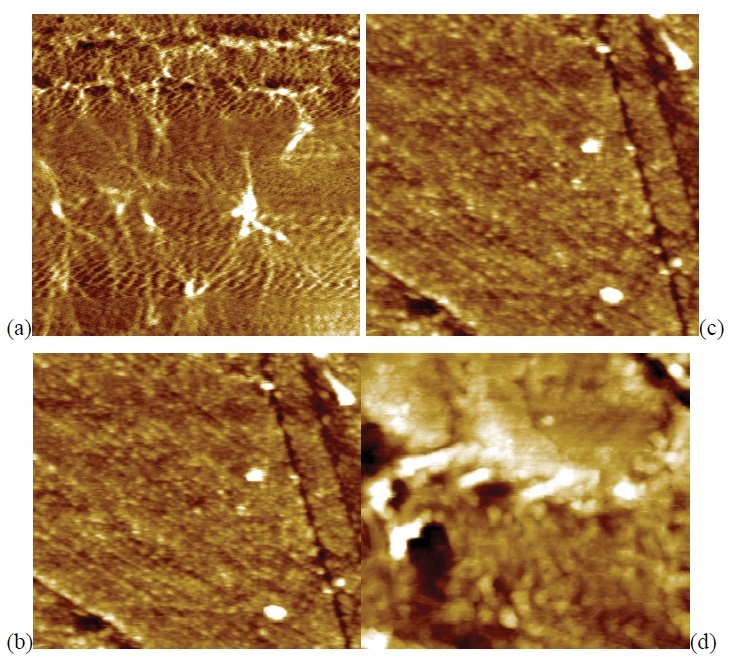 AFM images show no considerable changed in the roughness for the samples treated with different gases. It is a good evidence of oxygen etching, independent of the temperature substrate system, which explains the recovery of Ɵ in until 30 days. In this sense, fluorine treatment is more proper to promote good stable wettability in until 30 days. Both plasma immersion techniques are indicated to maintain the low surface roughness (bellow 5 nm), and to increase the optical transmittance at visible region (up to 80%). We would like to thanks the Brazilian agencies: CAPES, CNPq and FAPESP for financial support.